1/1, July 1922-1926. 4-8 pp., price originally included in the dues for the Neuer Gral-Orden (New Grail Order). 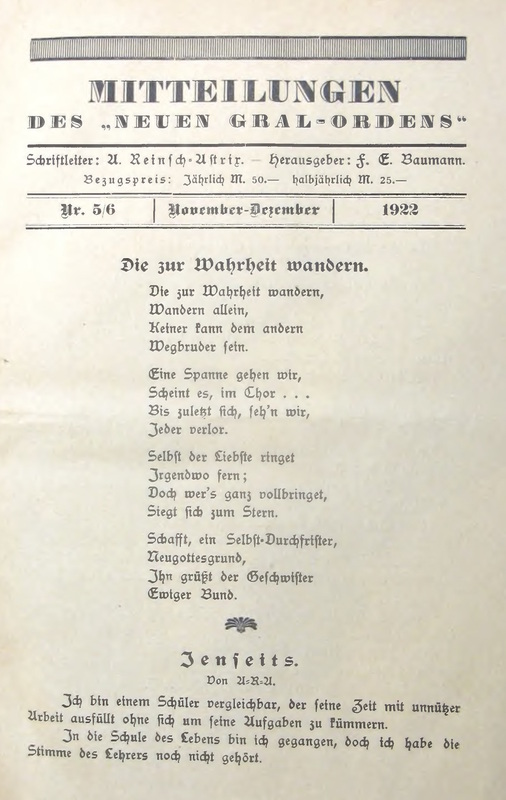 This was a supplement originally included with Zum Licht as the organ of the NGO, which was Peter Christoph Martens' attempt to revive Parsival Braun's Gral-Orden after Braun's disillusionment and the absconding of T.K. (John E. Richardson). On the Gralorden, see the notes under Christliche Theosophie, The New Man, and Zum Licht, and also P. Ch. Martens, Geheime Gesellschaften in alter und neuer Zeit, 2d ed revised (Bad Schmiedeberg and Leipzig: Verlag von F.E. Baumann, n.d. [c. 1923]), 225-230. The NGO was very successful in the early 1920s and the journal recounts the lodge doings of several dozen lodges in Germany, Switzerland, Austria, Czechoslovakia, Poland and Sweden. In its first issue it carried a letter from a member expressing his joy at the establishment of of a "Gnostic School" by another of the members, who was not named. This was E.C.H. Peithmann, who has a history of his own. See the note under Hain der Isis. The order attempted to make good the absence of Masters (Braun and T.K.) by reprinting Braun's Meisterbriefe: Die Entwicklung eines Meisters, eine Reihe von Lehrbriefen in 3 Abteilungen and Lehrgange: Die Erweckung und Entwicklung der höheren Geisteskräfte im Menschen, originally reserved for the members of the order as they advanced through the degrees. For a time, the order attempted to recruit older and more experienced students to reply to the questions of new members, but this was not a success and over time the order and the journal more and more reverted to the discussion of occultism generally. ZDB: Berlin SBB Haus Potsdamer Str; Halle/S UuLB; Leipzig DNB.